I remember my dad saying "next time, we'll hike up to the top of that next peak" (above). Unfortunately, there was never a "next time" - and we never made that hike. It's called Goat Peak, at least it was a long time ago. I've never heard anyone call it that. I called it "1729" (which is it's elevation). Everyone else refers to it as High Peak. Let's go with that. I bought a trail map a while back. No trail to the top. Hmmm. But thanks to Google Earth, I was able to discover that, yes, there is an unnamed trail, and even found the trailhead (at the top of Chautauqua Blvd, in Pacific Palisades). Four years ago, while we were living in Los Angeles, I finally hiked to the top of High Peak. The photo above was taken about 6am near the base of the trail, with High Peak in the distance. It's a challenging hike: steep inclines in places, loose rock, and literally some rock climbing towards the top. However, the views at the top are simply spectacular. The photo above does not do it justice. It was close to a 360 degree view. Continuing on for about a mile, this unmarked trail actually hooks up with the "Rogers Road" trail, which I took back down into Will Rogers State Park. Again, until you get to the Rogers Road trail, it's an unmarked trail, and is difficult to follow in places. I do not recommend this as a "first hike" and, unless you're familiar with Santa Monica Mountains, would not recommend trying it alone. Looking again at my topographic map, I found that, indeed, there is a trail that I had never noticed before. 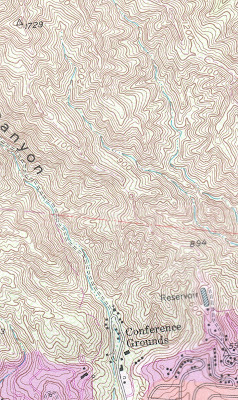 If you click on the map for a larger view, you can clearly see the trail. Challenging but do able. From the Chautauqua trailhead to the top of High Peak took about an hour. It was worth it. And all within the city limits of Los Angeles. Here's a map to the trailhead in Pacific Palisades. I'm curious about where you heard High Peak was called Goat Peak. I've hiked it hundreds of times starting when I was a kid in the late '60's. On the summit back then was a register going back to 1967. It was called "High Point" on that register. The proper way to do it is from the Conference Grounds, the same place you start the Skull Rock Loop trail. The correct name is High Point. Some nice chap named Sherman has been maintaining this, and other nearby trails. Without the brush clearance, it would be a hard bushwack. The ascent by the very next ridge going East, splitting the two forks of Rivas Canyon, is a better hike with better views along the way. Unfortunately the trail up that way is rather rough, although Sherman has done some work on it. There is a fascinating geological/geographic feature apparent from this hike. I'll let you find it yourself! The legend says that it is called Goat Peak because a couple of Portola's scouts saw a goat at the summit. When Will Rogers was asked if he wanted the peak renamed after himself, he replied. "No. I don't want to rob the goat of his glory." I did this hike yesterday - chautauqua to rogers road, return via rivas. But I have a question. Is High Point/Goat Peak the one after the rock scramble with a clearing at the top. Or is it the next one? My feeling its the next one -- I think I found the spot for the register. Or maybe its really two different peaks? @ Dean - I think the actual peak is the first one. But that's just my educated guess based on the US Geological Survey Market at the top. According to a topographic map, it's 1729. Perhaps someone else more familar with this peak could leave a comment to confirm -or correct - this. @David - I'm using Garmin Topo maps. They don't have the same markings. I checked out the USGS Topanga quad that you have posted. After being able to look at the area north of where yours is cutoff I conclude that 1729 is indeed where the clearing is. If you look at aerials of the next peak there is a trail going east then south back down toward rivas. The contours show the same. I also found a small stone circle under a tree at next peak but with nothing in it. Is this the lost register's resting spot? And if that is supposed to be High Point then is 1729 not High Point? More riddles. I was talking to one of the residences and she called the guy who cleared the trails in the area Winston (not Sherman as above) He lives just past the gate and was the President of Santa Monica Conservancy at one time. Another resident told me its ok to park (legally) on the "Private Road." The tow away signs were put there by another resident. I first hiked up High Peak September 9th, 1969. I've hiked up there hundreds of times since. The register we found there in '69 called it High Point and went back to 1967. It is a big part of =my childhood.